Owls: Who Does Not Love Them? by Park Ranger Matt Palmquist, Silver Falls State Park. THE WISE, NIGHT-DWELLING, inquisitive raptors with human-like expressions – there’s something for everyone to love. These unique birds are incredibly well adapted for their lifestyle, and there are nine species that can be found at Silver Falls State Park. What defines an owl? Owls are nocturnal birds of prey, all of which are found within two families: most within Strigidae (true owls), with a few others within Tytonidae (barn owls). They all share common characteristics, the most salient being that they hunt mainly at night. They are the nocturnal counterpart to many other raptors that we are accustomed to seeing, such as eagles, hawks, and falcons. One cannot discuss owls without bringing up their adaptations – that is, the traits that allow them to hunt at night. Firstly – their amazing eyesight. We’ve all heard the expression “eagle eyes,” and eagles deserve this great distinction. Owls, though, also have superb eyesight, but theirs is specialized for seeing in the dark. Their color vision is poor, but that is made up for by their ability to see in the dark. Their eyes contain far more rods (for seeing in low light) than cones (for seeing colors); humans are the opposite, which is why we can see colors well but have poor night vision. In addition, owls are far-sighted, allowing them to see their prey from a great distance. Owl eyes, as powerful as they are, are unable to move like human eyes. They are cylindrically shaped and fixed within their sockets. In order to move their eyes, they have to move their whole head. Contrary to popular belief, owls cannot turn their head in a full circle, but can still turn it an impressive 270°. Their neck contains 14 vertebrae – compared to 7 in humans – that allows them to do this. 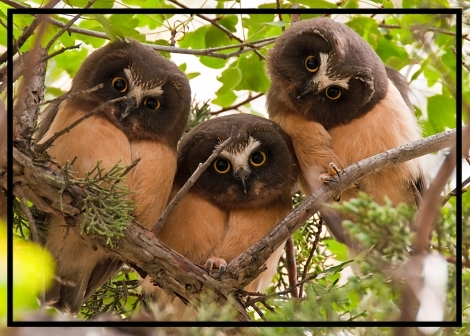 While owls’ eyesight is very impressive, their hearing is even more so. Their ears are located toward the front of their head, and they have a facial disk of feathers that funnels sound into their ears – like a built in satellite dish. Moreover, their ears are placed asymmetrically on their head; one is higher than the other and by bobbing and turning their head, they can pinpoint sounds and locate prey. Owls’ hearing is so keen that they can even hunt blindfolded, using only their ears. Another of the owl’s adaptations is the ability to fly silently. They have large wings that allow them to soar without flapping too much, and the leading edge of their flight feathers is fringed like a comb, which breaks up turbulence and allows them to fly almost without a sound. This gives them the ability to hunt by stealth, ensuring that their prey – ranging from small songbirds for the pygmy owl to skunks for the great horned owl – will not hear them coming. Silver Falls’ owls range greatly in size and character from the tiny northern pygmy owl (imagine a tennis ball with wings) to the great gray owl, which can stand over two feet tall. The owls are rarely seen, but if you listen at the right time you can hear their calls. The high pitched “toot-toot-toot” of the pygmy owl can be heard most mornings in the South Falls day-use area, while at night you may hear the comical “who cooks for you? Who cooks for you-all?” of the barred owl. If you’re really curious, try coming to one of our Owl Prowls, held each year in the early spring, during which we try calling for various owls, usually with great success. It’s a memory that will last a lifetime! Newer PostIs a Hairy Woodpecker Actually Hairy?